“Brood of vipers! How can you, being evil, speak good things? For out of the abundance of the heart the mouth speaks. A good man out of the good treasure of his heart brings forth good things, and an evil man out of the evil treasure brings forth evil things. But I say to you that for every idle word men may speak, they will give account of it in the day of judgment. For by your words you will be justified, and by your words you will be condemned.”(Matthew 12:34‭-‬37). “Wherefore the Lord said, Forasmuch as this people draw near me with their mouth, and with their lips do honour me, but have removed their heart far from me, and their fear toward me is taught by the precept of men: Therefore, behold, I will proceed to do a marvellous work among this people, even a marvellous work and a wonder: for the wisdom of their wise men shall perish, and the understanding of their prudent men shall be hid. Woe unto them that seek deep to hide their counsel from the Lord , and their works are in the dark, and they say, Who seeth us? and who knoweth us? (Isaiah 29:13‭-‬15). “‘These people draw near to Me with their mouth, And honor Me with their lips, But their heart is far from Me. And in vain they worship Me, Teaching as doctrines the commandments of men.’ ” When He had called the multitude to Himself, He said to them, “Hear and understand: Not what goes into the mouth defiles a man; but what comes out of the mouth, this defiles a man.”(Matthew 15:8‭-‬11). ♧“A good man out of the good treasure of his heart brings forth good; and an evil man out of the evil treasure of his heart brings forth evil. For out of the abundance of the heart his mouth speaks”. (Luke 6:45). ♧”You shall love the Lord your God with all your heart, with all your soul, and with all your strength. “And these words which I command you today shall be in your heart. You shall teach them diligently to your children, and shall talk of them when you sit in your house, when you walk by the way, when you lie down, and when you rise up. You shall bind them as a sign on your hand, and they shall be as frontlets between your eyes. You shall write them on the doorposts of your house and on your gates”, (Deuteronomy 6:5‭-‬9). 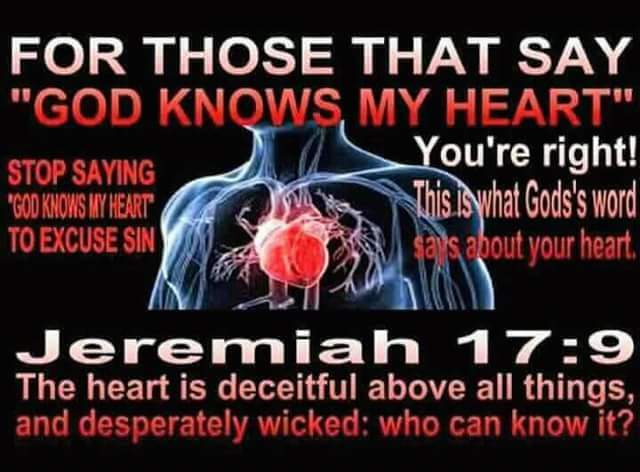 ♧”The heart is deceitful above all things, And desperately wicked; Who can know it? I, the Lord , search the heart, I test the mind, Even to give every man according to his ways, According to the fruit of his doings”. (Jeremiah 17:9‭-‬10). ♧”The heart of the righteous studies how to answer, But the mouth of the wicked pours forth evil. The Lord is far from the wicked, But He hears the prayer of the righteous. The light of the eyes rejoices the heart, And a good report makes the bones healthy”. (Proverbs 15:28‭-‬30). ♧”The heart of the wise teaches his mouth, And adds learning to his lips. Pleasant words are like a honeycomb, Sweetness to the soul and health to the bones. There is a way that seems right to a man, But its end is the way of death”. (Proverbs 16:23‭-‬25). ♧”And behold, a certain lawyer stood up and tested Him, saying, “Teacher, what shall I do to inherit eternal life?” He said to him, “What is written in the law? What is your reading of it? ” So he answered and said, “ ‘You shall love the Lord your God with all your heart, with all your soul, with all your strength, and with all your mind,’ and ‘your neighbor as yourself.’ ”(Luke 10:25‭-‬27). If any man’s work abide which he has built thereupon, he shall receive a reward. •In Christ we have all that pertains to life and godliness. And whatsoever all of you do, do it heartily, as to the Lord, and not unto men. •Knowing that God’s work done His way will never lack His supply. •Put the Love of God in everything you do, and in everything you do put your Faith in God. •You will reap many rewards in this life and in the life to come. •Continue to let the Word of God be the standard for your life. Blessed you are and blessed you will always be and to God be all the glory. Amen! This entry was posted in Daily Message and tagged are you giving God all your heart, what is your heart saying. ← WHAT SIN IS ENTICING YOU?